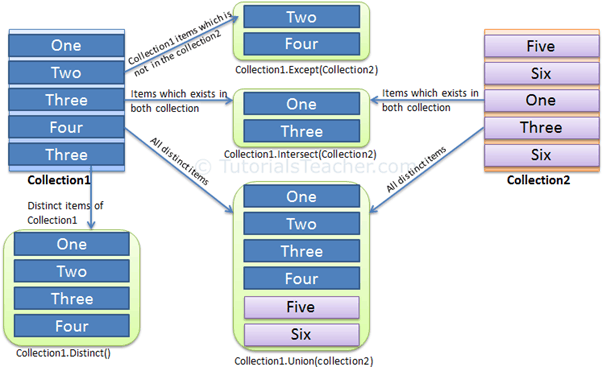 The Intersect extension method requires two collections. It returns a new collection that includes common elements that exists in both the collection. Consider the following example. The Intersect extension method doesn't return the correct result for the collection of complex types. You need to implement IEqualityComparer interface in order to get the correct result from Intersect method. The Intersect operator is Not Supported in C# & VB.Net Query syntax. However, you can use the Intersect method on a query variable or wrap whole query into brackets and then call Intersect().